Recently, speaking at a banking conference in St Petersburg, Elvira Nabiullina, head of the Central Bank of Russia outlined the CBR position on foreign exchange reserves. 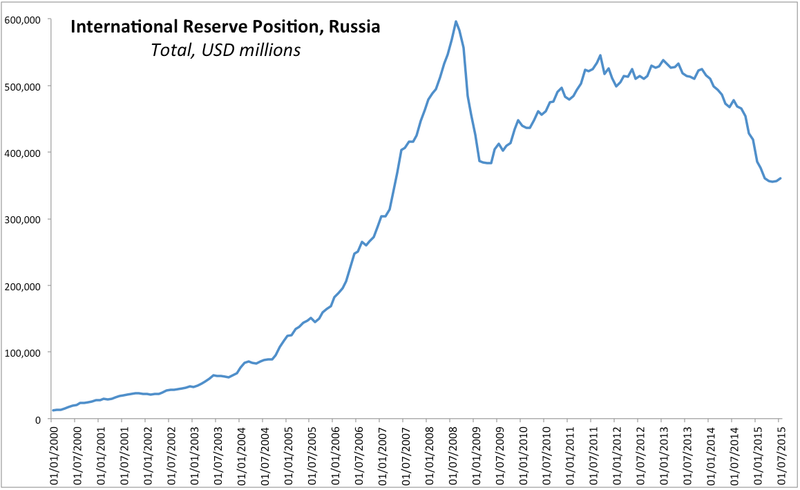 Nabiullina note that Russian reserves are large - sufficient to cover almost 11 months of imports. 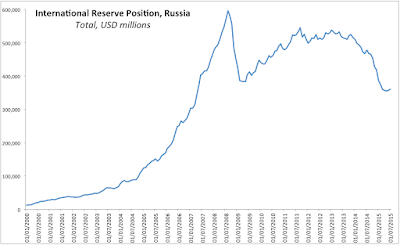 However, Nabiullina's 'comfort zone' target for the reserves to cover 2-3 years of "substantial capital outflows", implying she would like to see Russian reserves rising back to USD500 billion mark. Nabiullina is now targeting purchases of forex over the next few years to drive up reserves and to that objective she has been buying on average USD200mln worth of forex per day since mid-May. In line with forex reserves rebuilding objective, Nabiullina cautioned about markets expectations of further large scale cuts to interest rates as the CBR is trying to balance out inflation targeting (requiring tighter monetary policy), investment supports (requiring looser policy) and accumulation of reserves (implying looser policy). Per Nabiullina: "Attempts to reduce the interest rates too fast or even acquire certain assets may simply lead to stronger inflation, to an outflow of capital or to dollarisation of the economy, and that would slow down the economic growth, other than promote it." In its latest outlook, CBR forecast unemployment reaching 6.5% this year from the current rate of 5.6%, before falling to 5.6-5.8% by 2018. GDP is expected to shrink 3.2% in 2015, returning to trend growth of 1.7-2.4% around 2017-2018. Inflation is expected to hit 11% at the end of 2015 with rather optimistic outlook for a decline to "less than 7%" by June 2016, and "close to the target level" of 4% in 2017. Net capital outflows are expected to decline from USD90 billion in 2015 to USD55-65 billion in 2018. "We are expecting the financial sanctions against Russia to remain in place. Payments on foreign debts during this period will constitute the bulk of the capital outflow. It will gradually reduce from $90 billion to about $55-65 billion during 2015-2018, depending on the scenario," according to Nabiullina. Russian International Reserves reached USD360.6 billion at the end of last week, up on USD356 billion low registered in April 2015. Still, the reserves are down USD117.7 billion y/y (-24.6%) and down USD132.73 billion (-26.9%) on pre-sanctions period.